This easy recipe for salmon with toasted bread crumbs and asparagus cooks up in no time all in one pan for a delicious healthy supper! Get nice thin asparagus for the best roasting results. This ready-in-20-minutes supper (yes you read that right) is one of my summertime favorites. It’s all kind of healthy, it involves the minimum amount of time in the kitchen when what you really want to be doing is enjoying the beautiful outside summertime, and most importantly, it is SCRUMPTIOUS. 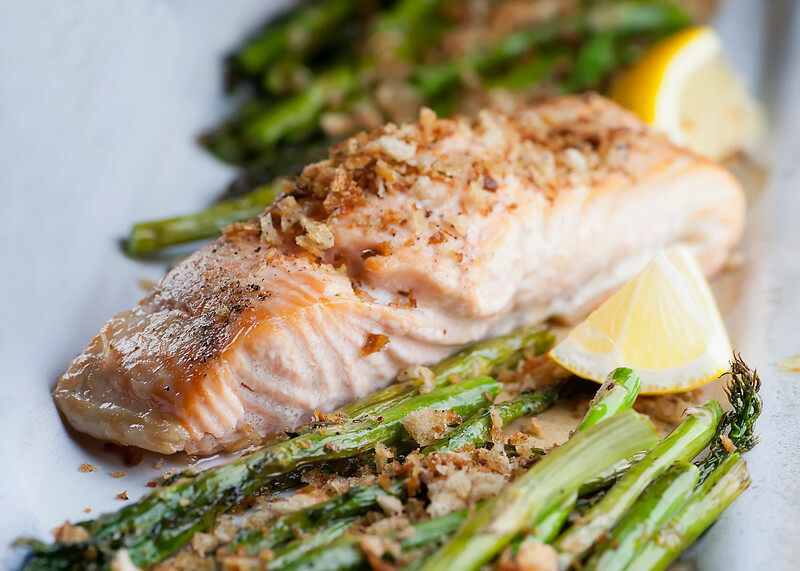 Tender flaky salmon, cheery asparagus, the bright flavor of lemon, all topped off with crunchy crispy breadcrumbs. Ready for some salmon with toasted bread crumbs deliciousness? Let’s make it! Speaking of summertime favorites, remember my post last week where I showed you my new cocktail crush, the strawberry basil margarita? Well, it was SO delicious that we went back again this past Friday so I could have another. 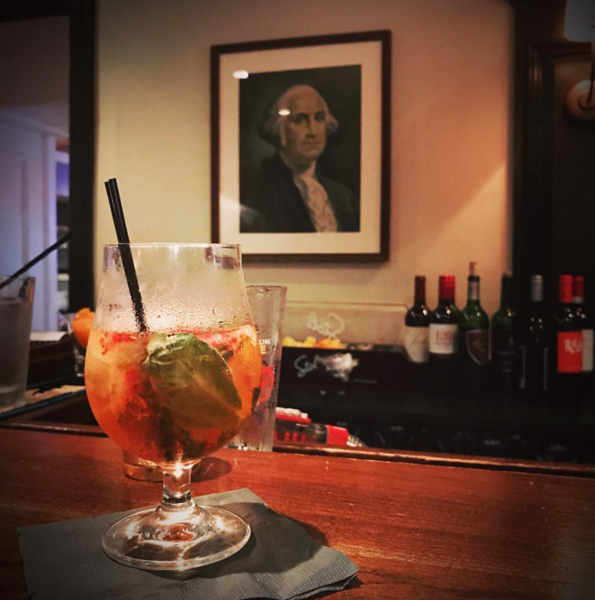 Before I knew it, it was halfway gone, and I was considering whether I could/should have another when I looked up and none other than George Washington was silently judging me. I mean, tell me he isn’t looking DIRECTLY at both me and my margarita?? As it turned out, they ran out of strawberries and so mine was the last strawberry margarita of the evening, so I just made the most of that perfect one, and George was highly relieved. Meantime back at this salmon recipe, you want some nice salmon filets and a bunch of thin asparagus. You are going to roast them up in your oven until they are both tender and perfect, and while this is happening you are going to toast up some fresh breadcrumbs on the stove until they are just the right amount of golden and crispy. I like to season mine up with salt and pepper and oregano. Now all that’s left to do is serve it up! Divide the salmon and the asparagus amongst the plates and give each plate a generous dusting of those golden crumbs. I like to give each serving a squeeze of lemon juice just for good measure, and I toss the extra lemon wedges on the side in case anyone wants some extra lemon flavor. Preheat oven to 450 and line a rimmed baking dish with foil. Place salmon and asparagus on the baking dish and drizzle with olive oil. (If your salmon steaks have a thin end, tuck it under so it doesn’t get dried out.) Sprinkle with salt and pepper and roast for 15 minutes. While the salmon is roasting, heat 2 tablespoons olive oil in a medium skillet over medium high heat. Add bread crumbs and stir until golden and crispy. Remove from heat add a pinch of salt and pepper and stir in the oregano. 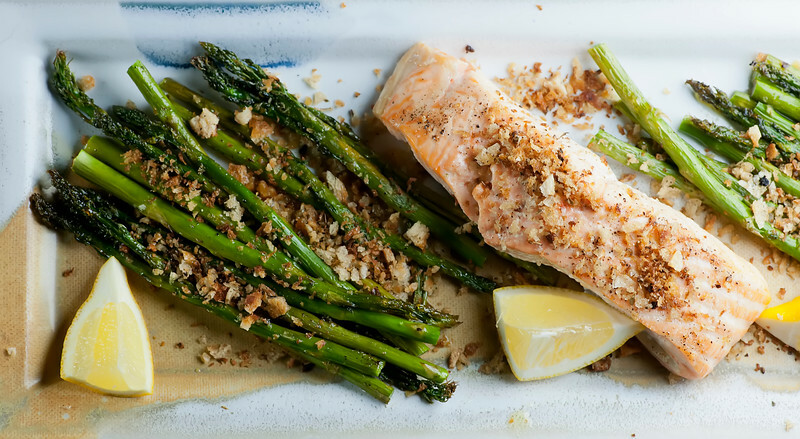 Divide salmon and asparagus among plates and sprinkle with breadcrumbs. Squeeze a little lemon on top and serve with extra lemon wedges on the side. This is definitely one of our busy weeknight faves! Yum! Look forward to this– sounds so tasty and easy! This is my kind of summer meal Kate! Love this light meal, so perfect for summer! And the texture the bread crumbs bring to the dish looks delicious! Thanks Lucy – hope you love it!